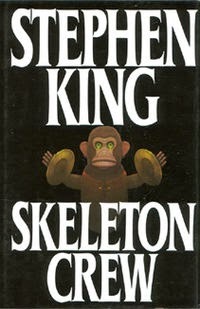 Skeleton Crew is King's second collection of short stories (though one of them - "The Mist" could actually be treated as a standalone novel(la) ). The first thing that immediately comes to my mind when I think about it is variety. There are nineteen short stories, two poems and the above-mentioned novella. There's also an afterword from the author at the end, which is always an enjoyable read and offers interesting insights into various inspirations and 'stories-behind-stories'. As far as the stories are concerned, there are a few true gems among them. It's really hard to pick a favorite. I'll just quickly go through the ones that I liked the most. "The Monkey" is a story about a cursed toy. Each time the cymbal-clapping monkey plays, someone dies. It might seem like a parody of a horror story at first glance and in a way it is. However, there are some very good descriptions of what's going through the head of the protagonist along with some very suggestive descriptions of his emotions. You can almost feel sweat trickling down your spine as you read it. "The Jaunt", a short tribute to Alfred Bester's "The Stars My Destination" is an unusual tale for King. First off, the setting - science fiction and the future in general are not typical elements of his works. The story pays homage to the original work nicely but King adds his own touch of grotesque horror and the ending leaves you not feeling too comfortable. Speaking of feeling unsettled - the "Survivor Type" is a story that is really hard to read. It's basically a diary of a surgeon (involved in drug trafficking) who ends up on a tiny desert island. He has no food and he has only heroin with him along with some surgical tools. He has an accident in which he breaks his ankle and soon realizes that he needs to perform an amputation. He survives (using heroin as anesthetic) but after a while it becomes clear to him that in order to survive he will have to eat the amputated foot. His torment doesn't end here as other limbs soon have to go. It's not a pleasant read at all but you can appreciate King's use of language as the protagonist's notes gradually become more disjointed and less comprehensible. "The Mist" is the longest story in the book and it can be treated as a novella. Unfortunately, a few years ago I saw Frank Darabont's movie (a pretty good screening to tell the truth) which spoiled it for me. Here King plays with the idea of devastating effects of secret army experiments. They result in a catastrophe on a potentially huge scale. I liked the idea of showing the crisis through the eyes of inhabitants of small town who are stuck in a supermarket during the crisis. The author also plays with the idea of who the real monsters are (surprise, surprise - it's the humans again!) and the negative effects of religious fanaticism (it seems to me that it's something King dislikes particularly strongly). It's a good read and for those who were dismayed with the movie's outcome - here it ends differently. These were the ones that stood out the most to me but some of the other stories also read very well. I can easily imagine "The Raft" screened as another (run-of-the-mill) horror movie about teenagers who first get drunk and then get into trouble with something Evil.The miraculous gadget from "Word Processor of the Gods" is something that everyone would like to have (and use sometime too). "The Ballad of the Flexible Bullet" is an interesting story about a man's gradual descent into madness. "Skeleton Crew" is a very solid collection of short stories. Not all of them are exceptionally good but the range and themes of them is so big that everyone should be able to find something of interest here. True, it's kind of hard to get it out of your head once you've read it. "The Raft" was one part of the "Creepshow 2" anthology movie, and "Word Processor of the Gods," was filmed for Season 1, Episode 8 of "Tales from the Darkside." I haven't done any ersearch but it doesn't surprise me. Many of King's works were turned into movies and some (well, most) of them are unfortunately quite bad. Was it the case with the ones you've mentioned?